Skiing and snowboarding is hands down the BEST thing to do during the winter in Wanaka! (Yes of course I am a little biased!). But reality says… most people's legs just can’t ski or snowboard for 4, 5 or more days straight. Unless of course you have thighs of steel! That means for the majority of us, somewhere in your ski holiday you are going to have a day or two off the snow. So, what to do with that day off you ask? Well, Wanaka is one of the most incredible places in the world! (This is not bias, it’s an actual fact!). Right at your door step there are so many choices of rad things you can do! Within minutes you can be cruising on one of the many bike tracks Wanaka has to offer. Or heading out to the local airport for a skydive! The options are endless! To help you with your decision making, as win – win options are always hard! I thought I would help you out, and give you all a little brief on a just a handful of the options available. Of course there are more activities out there, more than this blog post can handle though! Okay, so this might not be a ‘day off’ activity, but it is certainly a goodie! If you have not experienced heli-skiing before, it is an incredible experience. 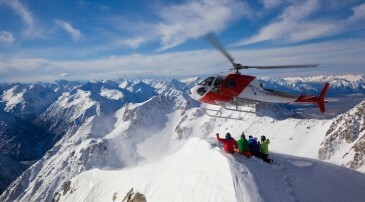 You get fresh powder, first tracks, the slopes to yourself and you get to ride in a chopper! You just won’t be able to stop smiling! Now this activity will rest your legs. You may find them shaking a little, but it won’t be due to fatigue. More likely it will be due to the 12 – 15 thousand feet of air between you and the ground! You get amazing views from both the flight and skydive. This one will keep you smiling for the rest of your holiday! 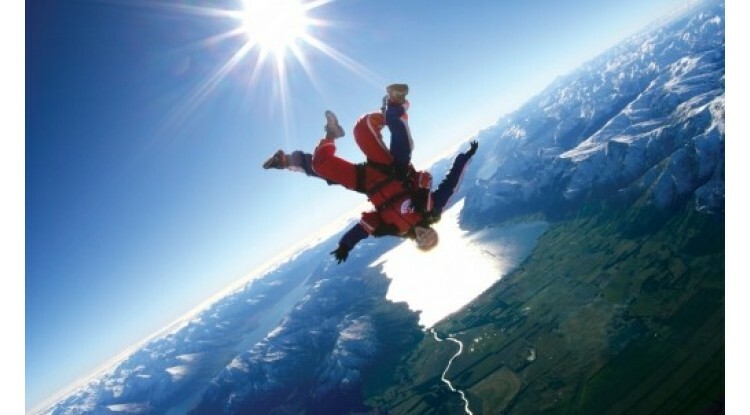 I highly recommend a Wanaka Skydive; as you can see from the photo below, it is truly a liberating experience. If you are looking for something a little more passive, Wanaka River Journey’s has you covered. Ride in their comfortable jet boat down the beautiful Matukituki valley, and take in the magnificent scenery the valley has to offer. At the end of the valley, the boat will pull up and you have the chance to take a stroll in the native bush. You will find it peaceful, all you will hear is the river and the birds, a perfect slice of New Zealand. New Zealand is known for it’s Bungying Jumping! Queenstown is home to the first AJ Hackett Bungy off the Kawarau Bridge. The bridge is 43 metres high to be precise. This one takes a little more courage than the skydive, as you are the one who has to step off! Certainly rests the ski legs though! This jet boat ride is one for more of the thrill seeker. It’s going to go fast and you might get wet! The skilful drivers are set out to make you smile, laugh and scream, as they sprint up the river coming seemingly close to the cliff sides and rocks! Sharp turns and 360s. Such a thrill! Wanaka is in the Otago region, and Otago is known for it’s fine New Zealand wines. There are vineyards scattered all around Wanaka and Queenstown. A perfect way to taste your way around these wineries is with Julie from Funny French Cars. Julie a true local knows everything and all the gossip! She will personalise the tour as you go, entertaining you the whole way along. You will undoubtedly have great day out! Wanaka’s endless bike tracks are not to be missed. From the first time biker to the advanced renegade, Wanaka has it covered. Bikes can be hired from town, and from there it is literally just minutes to the trails. There is a nice meandering double width track around the lake that will keep the novices happy. And places called Sticky Forest and Dean's Bank will keep the more extreme entertained, with radical downhill tracks combined with easy climbs. Just awesome! Now don’t get too excited about all those activities, remember what I said at the beginning – Skiing and Snowboarding are the BEST activities you can do in Wanaka in the winter! These ones are just for your days off the snow!!! That’s is all from me for now, happy decision making! Note: If you are on our Wanaka Adventure Tour, we can organise any of these activities for you. You can add them to your ski holiday package before you arrive, or make up your mind once you are here. It’s as easy as that! Note: For more information about Lake Wanaka you can check out their tourism website here.